The following article article and photograph are Copyright 1998 by the Rogue River Express. Jim Armstrong is an advocate for train safety issues. The railroad tracks run through Gold Hill and Rogue River, past houses and alongside the river, and sometimes the engineer blowing the whistle on the locomotive is Rogue River resident Jim Armstrong. With a special double toot for his wife Lori, he rides through and is gone. Jim started working for Central Oregon & Pacific Railroad almost four years ago as a transportation specialist which means he's an engineer, conductor and brakeman. Sometimes he hauls cars to California or to Eugene, but mostly he rides around Medford and Grants Pass. "It's a great job. I get to work outside, and it's never the same thing everyday. It changes." The trains he runs are fairly small. The longest he's ever hauled consisted of 108 cars, but knowing that even empty cars weigh 35 tons and that chugging along at speeds of 25 miles per hour can take a quarter of a mile to stop, has made Jim very aware of safety. "It's dangerous for me but more so for people who don't know anything about the trains," he said. He's seen children playing on tracks and railroad bridges, cars ignoring the gates and lights at crossings, and more than one close call with trespassing pedestrians. 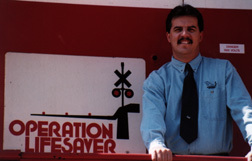 That's why he's involved with the Operation Lifesaver program which developed the presentations Jim gives to schools, truck and bus drivers, civic groups, and other organizations outlining awareness of train safety issues. And he's full of relevant statistics. For example, did you know that a train traveling at 55 m.p.h. can take a mile or more to stop or that a vehicle and a train collide about every 90 minutes in the United States? The first seven months of 1998 saw nine trespasser fatalities, five injuries, and one motor vehicle fatality in the state, not including the recent Klamath Falls tragedy. Jim has given 21 half-hour presentations this year highlighting many pieces of good advice, such as looking both ways before crossing tracks and never putting coins or rocks on the rails as they can become dangerous projectiles when the wheels run over them. If anyone is interested in booking a presentation, call Jim at (541) 857-5148 or 857-9670. Before the railroad, Jim spent 14 years in the aerospace industry and served four years as a volunteer firefighter with the Rogue River Fire Department. "I used to watch the guys switching cars in the train yard and wondered what it would be like to do that," but now that he has firsthand experience it hasn't diminished his interest. In fact, his number one hobby is building and painting model trains. He and his wife took a trip together recently, and just before he left he turned with a twinkle in his eye and a wide smile on his face, pleased with the idea that while on his vacation he might get the chance to ride another train, but this time as a passenger.